The evening’s program will include works by Caldara, Ucellini, Gluck and others. In addition to the ensemble members, there will be featured performances by cornet, voice, and English horn. Founding member and special guest Katrin Meingast, visiting us from Dresden, Germany will be joining the ensemble on cello. 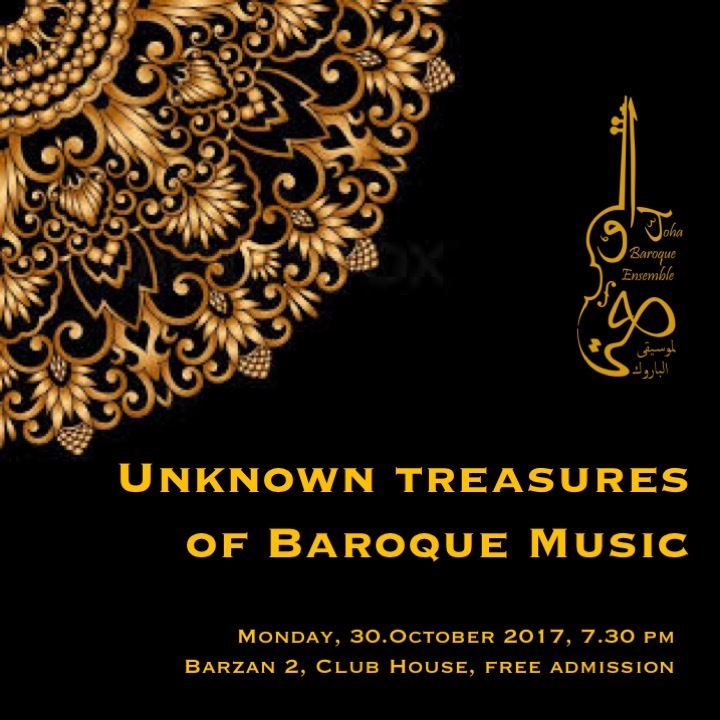 The concert at the Barzan 2 Club House will be followed by a potluck dinner at villa 14. Please bring a dish and/or drinks to share. Admission is free, but we will need to supply a guest list to the guards at the front gate. To reserve a spot, please RSVP to 7011-8887 or jenny.taynen@gmail.com. Please park outside the compound or at the guest parking at the Club House. The security at the gate will have a list of guests and we kindly ask that you check in with them upon arrival. Please bring a dish and/or drinks to share at the dinner following the concert. Food and beverages can be left at villa 14 ahead of the performance.